World Wrestling Entertainment has become one of the largest sports entertainment companies primarily dealing in professional wrestling. It is a publicly traded, privately owned company that derives its revenues from films, music, product licensing and direct product sales. With more than 14.4 million viewers in the U.S, it has become the largest professional wrestling company in the world. It has two major brands, known as RAW and SmackDown which are aired in more than 145 countries in 30 languages of the world (Economypoint ( 2008). The main person behind this thriving entertainment company is the CEO and Chairman, Vince McMahon. 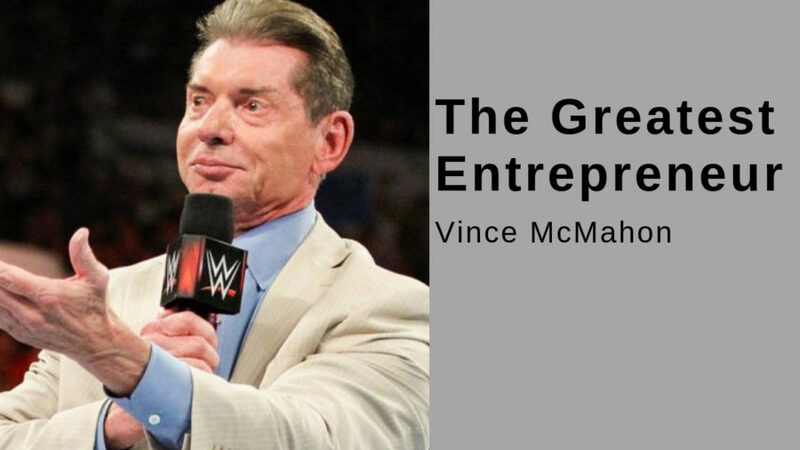 He turned WWE into the global phenomenon by applying his entrepreneurial skills and strategies. His role in the WCW and the ECW is also inspiring. His self-based character and dealings with the renowned wrestlers have forced an array of fans to tune in on their televisions. McMahon got into the business of wrestling because from the very beginning he was filled with the rewards of risk-taking and trying new things. Despite the fact that his father wanted him to be a lawyer or a doctor, but he chose to be into the promotion business. As he wanted to be traveling salesman, he got much inspiration by meeting his father real who was the promoter of Capitol Wrestling Company. His hunger for that career led him to force his father to get him into the company. His initial place of work was Maine where he was not well known at all. In 1972, he became a full-time employee in his father’s company. Capitol Wrestling Corporation. He worked so hard that, its syndicated programming reached to more than 30 T.V stations by 1979. Later on, he stepped into the ownership of the company by buying it from his father in 1982. Then he started to make it a regional operation and a national venture with sheer entrepreneurial skills (David (2010). Now we can easily observe his leadership role within the broadcast and entertainment industries where he, being a visionary promoter and a fearless marketer, pioneered the television syndication business and revolutionized the whole entertainment industry. Love him or hate him, McMahon has undoubtedly succeeded in turning his father’s regional wrestling operation into a global billion-dollar enterprise. No other single individual can claim to have had the same impact on the world of wrestling than McMahon (Brusch C.G., (2008). In fact, from the very start of his career at Capitol Wrestling Corporation, he had vision expanding it nationally and internationally. Hence he created an entirely new market niche in the entertainment industry by maintaining its leadership of being the best. To fulfill his vision of new making it a billion-dollar industry, he tried various strategies to bring innovation into the industry. For Instance, the videotapes of his weekly wrestling broadcasts, which were sent to other states, were limited, but he soon started to promote wrestling matches throughout the country. His vision has much broader prospects than that his father. He wanted to see professional wrestling into the mainstream entertainment industry and know that he can do so by enticing a broader audience (Evancarmichael, (2009). McMahon took some new steps during the late 1980s, by making WWF into a unique entertainment brand. With these initiatives, it did not attract family audiences but also forced its fans to pay attention to pro wrestling in a new way. He started a new revenue stream by promoting these events live on PPV television. McMahon conceptualized and commercialized the idea of directing his storyline towards highly-publicized super cards to completely revolutionize the event programming for all kinds of sports events. This boosted the impact of WWF and helped it grow and become into a multi-million dollar empire. Another entrepreneurial step of signing up the top talent was taken to weaken his competition and thus expand the business operations nationally. Here different strategies were applied to transform each wrestler into a whole new degree with the help of trading cards, lunch boxes etc. Thus they took different action figures that were more produced after these treatments (YoungEntrepreneur,(2008). This name change did not minimize the popularity of the WWF as McMahon applied an aggressive strategy of humorously telling wrestling audiences to “Get the F out”. Through these timely steps, the company soon started to reach the top position again. To make WWF publicly traded company, he took the bold step of an Initial public offering in October 1999. The Promoter and entrepreneur, Vince McMahon entirely changed the view of professional wrestling which was regarded as low profitable sports event for the promoters. It might have been around for more than a century; however, now it has emerged as a billion-dollar industry. Most of the credit goes to McMahon who took sheer risk-taking steps and initiatives to revolutionize it (Evancarmichael, (2007). Today we can easily observe the successes of WWE-World Wrestling Entertainment as its programs such as “Monday Night RAW,” Friday Night SmackDown” and WWE NXT” are broadcast in more than 145 countries of the world. Also, they are heard in more than 30 languages of the world. New television programmings are produced 52 weeks a year to capture the thrilling audience around the world, which has grown exponentially. Its live event audience is also increasing day by day as it can be easily judged that during 2009, 342 live events including 74 international events were performed to entertain more than two million audiences around the globe. Now McMahon’s undeterred leadership and innovative-thinking have transformed the traditional wrestling into one of the most popular and sophisticated forms of global entertainment. Being an integrated media and entertainment company, WWE has created a blend of specialized programs delivering original content. It has also developed these programs to entertain a cultivated, exited and intensely loyal audience. Broadcast, syndication and cable television, publication, mobile phone, and internet are the major media through which WWE has captured the global entertainment industry by marketing and distributing original content. In addition to it, WWE has also diversified into other ancillary businesses of licensing, merchandising, home video, e-commerce, catalog sales, and films. Its headquarters is located in Stamford, Conn. Furthermore, to expand its horizon throughout the world, it has opened its regional sub-offices in certain other cities of the world such as New York City, Los Angeles, Chicago, Toronto, London, Shanghai, and Tokyo. It is also traded on the New York Stock Exchange and the symbol WWE.